Sick day today. Probably for the best, because I don't want to be the person my co-workers blame when they get sick. It's going around the hospital... completely out of my hands. I'm on my fourth day of this sickness and I am totally over it. I have been taking DayQuil and NyQuil around the clock, which helps temporarily but does not kick it to the curb. I admit I should drink more fluids other than coffee, but because of the congestion whatever I drink quickly evaporates because of the mouth breathing. Yeah, you probably didn't want to hear about that. Back to the Future Part II is playing on ABC Family. And of course it is on, I love that trilogy. And I cannot wait for those fashions this year. And the Cubs winning the World Series. I'm putting my money on the Cubbies, baby! Leftover New Years Day ham and freshly cooked rice. Can't beat that. 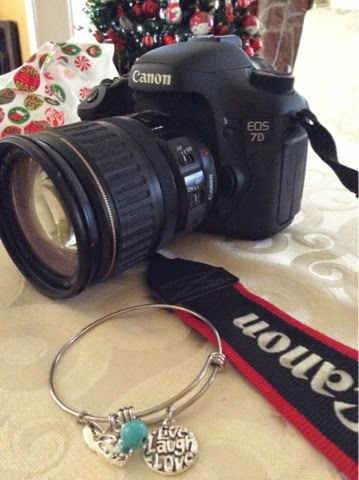 Some other gifts I received yesterday - a bracelet from my aunt, and my dad's Canon 7D. The last one I was surprised about. We were taking family photos when my dad asked me to get the camera from his room. I had to dig around, but I found it. By the time I got back downstairs, the picture taking was over. "You know what, I'm just going to give that to you." "Yes. Just buy a good lens for it, okay?" That was pretty awesome of him to do that, but immediately worst case scenarios popped into my head - the giving away of possessions - had me thinking red flags. Which of course made go down the list of signs to look out for. I talked to M about it. "Well, he hasn't used it in a long time." "Yeah, but he was just talking to me last week about buying a new lens for it." "Well maybe he gave you the camera because you were talking about buying a new one." Maybe his ultimate plan is to get a newer, lighter camera. Or maybe he knows it will more likely be used by me. Still, I am looking out for red flags. My dad asked for food from Tropical Grille. Food combo with soup and fried fish. Unfortunately they were closed today, so we got fried Whiting from Patnmark. I uses it's his backup fried fish option. I also scored a bunch of quick sale produce that looked completely fine. Four packages of fresh herbs for less than a dollar? Hell yes. Baby zucchini, limes, plum tomatoes, and plantains for great prices. 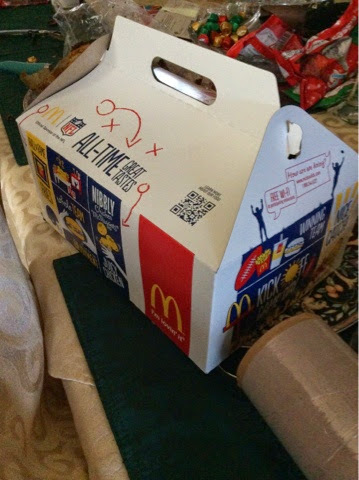 Bought the family combo pack from McDo. And the only one in the family who really ate it was me. I regret that purchase. I think I need to just stick to their coffee and fries. The day has flown by and now it's time for me to go back. Until next time.